As the years go by and the scandals of infidelity, irreconcilable differences and just plain losing interest in your first spouse, we forget about those ex-wives that are now distant memories as the new and improved version takes their place. It is a rare commodity for these powerful stars and moguls as they become more successful and richer, to stay with their first spousal choice. Sometimes it is because one partner has changed too much from all the success, other times she just got too old and they wanted a trophy wife on their arm. 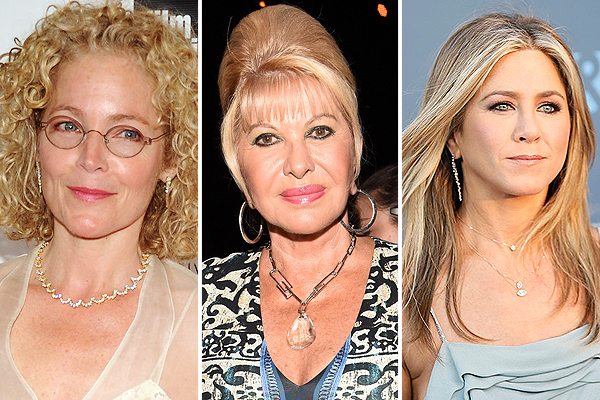 Whatever the reasons, here are some fairly big names that have an ex-wife in the membership of The First Wives’ Club. Now here is one ex that did not fade into obscurity. She has since been married several times and written a book on her marriage to Donald Trump. She also, at every opportunity takes advantage of the publicity that is brought to her now being the ex of the president of the United States. Her marriage to Trump came to an end over his affair with Marla Maples who he married in 1993 and then divorced. Trump is now on his third marriage to Melania. Including Jennifer Aniston in this list might be a bit unfair, being a powerful and famous woman herself, but she and Brad Pitt will always go down as one of Hollywood’s most famous “IT” couples, despite their scandalous divorce. They were young, beautiful, and extremely successful. They wed in 2000 but that marriage came to an end with the Brangelina affair. Pitt went on to marry Angelina Jolie which also came to an end this year. With the list of sexual misconduct allegations building up around the Hollywood producer’s career, his second marriage to Georgina Chapman has now also come to an end. Before Chapman, Weinstein was married to Eve Chilton who was his assistant. They married in 1987 but Chilton became increasingly uncomfortable with the publicity surrounding Weinstein’s success. They divorced in 2004 and she relocated to the suburbs of New York with her new husband. Smart girl. Amy Irving and Steven Spielberg were a Hollywood power couple. They met in 1976, and at the time, Irving was receiving praise for her role in Carrie and Spielberg had just directed Jaws. They married in 1984 but divorced in 1989 after Spielberg started dating Kate Capshaw, his present wife. Their divorce was a pricey one, too. Irving was awarded half of Spielberg’s fortune, in the amount of $100 million dollars. It all came down to a prenuptial agreement that was written on a cocktail napkin, which the judge invalidated. You’d think surviving a near death experience together could save a marriage, but that wasn’t the case for Richard Branson and Kristen Tomassi. Branson, billionaire and founder of The Virgin Group. The two had only gotten married two years prior, but they both were having affairs outside of their relationship. While on a deep-sea fishing trip while in Mexico to try and save their marriage, a severe storm struck the boat. Tomassi and Branson managed to swim to shore, but the boat (and everyone else on it) disappeared into the storm. The two ended up divorcing in 1979, after Tomassi left Branson for singer Kevin Ayers. These are just a few of the countless stories of the first wives that helped make their husbands successful, could not take the affairs anymore or just got past 35 and was replaced with a younger version. The stories are all different with many outcomes but the one thing they all have in common is they outgrew each other and one or both were not willing to change, cooperate or compromise. Game over! This is a man who is passionate about everything he does and takes action. Being inverted, it shows the ego side of that strong characteristic of wanting what you want when you want it at and in ego, that usually comes with the price tag of a marriage ending. Freedom to do what you want or need to do and impatience waiting for it. I would say this card is certainly representative of why these first marriages ended. Change is coming to a life situation and bringing balance. Regardless of the circumstances or reasons these first marriages ended, basically the shelf life of the partnership was over and change was inevitable.